The entry doors to any home offer both function and aesthetics. Sealing to keep unwanted drafts, noise and possibly critters out is essential, but you also want to consider the beauty a door, whether new, upgraded or refurbished can bring to your home, after all, it often delivers a first impression to guests! New doors can help make your home look more modern and welcoming, while increasing efficiency to keep heat or air conditioning inside and drafts outside. There are endless options for new doors, make sure you take the time to pick the best for your home, where your home is and the climate as well. Maybe the time to invest to replace your entry doors with new is not in the cards right now. No need to worry, refurbishing them can be a relatively easy and cost-effective way to make your doors look like new again! Consider adding a coat of paint to refresh the color or go bold and add a new color. Replacing the current doorknob or locks can have an impact as well. There are many small projects available to make your doors that first impression of your home look great! 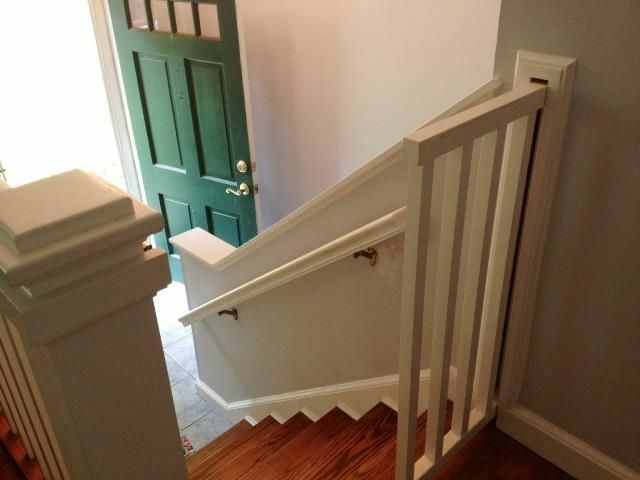 When it comes to door jambs and framing, consider contacting a Professionals for assistance. This type of repair can be cumbersome and require tools, saws and extremely careful measuring. Doors, who would have thought there were so many choices to making them an integral part of your home, whether repaired, replaced or upgraded. Taking the dog out can be a tedious task. Fur children can be the epitome of need, with their bathroom habits, exercise routines, and erratic sunbathing. If the barrier between the outdoors and the indoors is wholly dependent on you, you’re likely spending a lot of your day opening and closing doors. Why consider installing a pet door in your home? The pet door allows unfettered access in and out of the house, or just to certain areas of the house. It enables a homeowner to be gone for longer stretches of time without worrying that the dog has access to the outdoors when it needs to relieve itself. 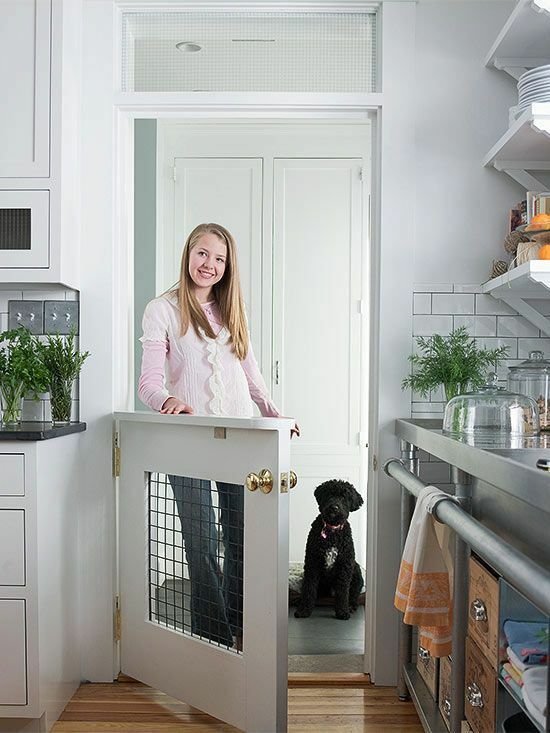 Dog doors allow the pet greater access to explore, play, and exercise, making for a happier, freer animal. He or she will have more places to hide and shelter, in case of danger or hazards such as weather. It also provides wider demarcation of protection again other animals, both domestic and wild. There is mutual protection for both pet and person from visitors, deliverymen and salespeople. They can also save owners damage and expense, as it significantly decreases the likelihood that a restless or frustrated pet will chew on furniture or have accidents within the house. Ultimately, of course, pet doors are all about safety, for both you and your pet. It’s a great stress reliever for humans and animals alike. Help your animals enjoy the spring and independence by installing a pet-friendly door. If you only want your pets in the back yard when your home, think about creating a pet door inside a screen door. This allows you to maintain a barrier between the yard and your home only when you want one, and when you don’t, just close the main door! These kits are also fairly easy to install yourself – you just need a screen cutter and screw driver. One thing to keep in mind though is climate. Do you live in a warm area? Or will having just a screen door between you and the outside drastically effect your homes temperature. Screens are ideal for sunny weather areas. Yes, it’s possible. With this option you can retain the heat of your home while also having the ability to block the doggy door off with the front screen. Unfortunately, glass cannot be as easily altered as screen. In order to install one of these you will need to replace one of the glass doors with a panel that already has a pet door installed. It’s fairly common that a home would have a window close to the floor. Many times these will be situated around a door frame, or near a deck. This can be a more affordable way to install a pet door as you don’t need to buy quite as large of a panel as you would for a door. A saw, a screwdriver, and a standard pet door is all you need to transform this entryway. Measure out the size of the doggy door, cut around it, put it in, when it’s flush with the door fasten it in with screws. That’s all you have to do. It’s fairly DIY, and if you’re looking for extra protection, you can purchase an electric pet door that has the option to lock so you can make your home more secure. A storm door with a pet door is going to be fairly similar to installing one in a wood door. The main thing you want to keep in mind when adding a doggy door to something as heavy duty as a storm door is weather. Not just any pet door will suffice in this situation, you’re going to want a storm dog door that prevents drafts, and something that can be locked and sealed. Altering a door built for extreme weather necessitates buying a more durable pet door – otherwise you’re defeating the purpose. Whatever your pet door needs, we can find a solution. Help your furry friends enjoy the warm weather to come! For assistance installing a doggy door, or for a free quote, call 866-FIX-MY-HOME. At Handyman Matters, we love our pets. Whether they are dogs, cats, fishes, pigs, bunnies, hamsters, birds… pets make the best housemates. One of the most functional additions to a home is the dog bath. A great mudroom addition that will keep your pups clean without all the maneuvering. Especially with the extendable shower-head and splash guard, this shower will save pet owners a lot of headaches. Pooches are curious creatures. Put them in front of a window, and they could be there all day. But there may not always be window of the correct height for your pup. Do you have a tall backyard fence because you need to keep in a large dog? Consider a mid fence cut out. Or maybe you have an especially little dog. Windows of normal height can be complicated to get up to without assistance. 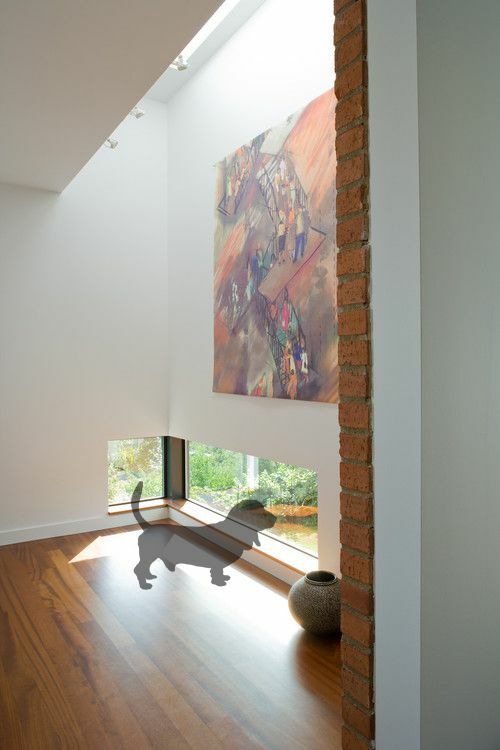 Add extra light to your home by installing a modern, floor level window. There may be a portable gate, but when it comes to larger dogs, these gates usually fold under the pressure. For persistent dogs, you will need a sturdier, installed gate. 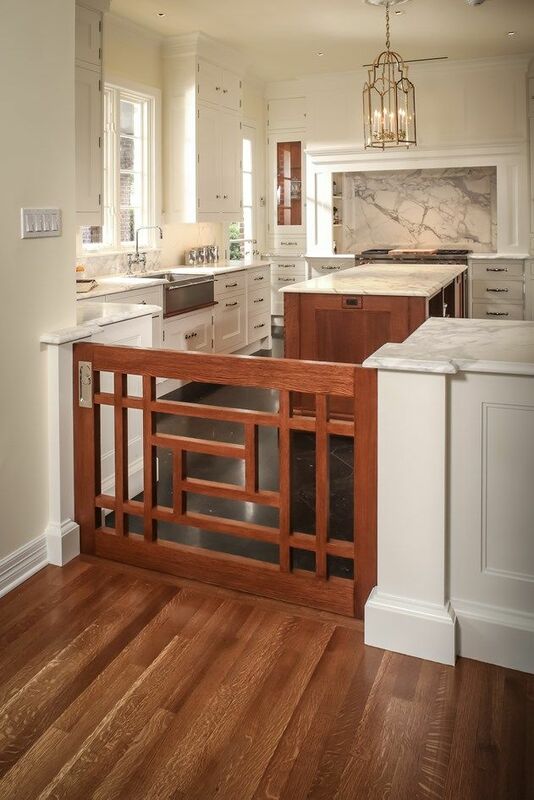 Whether it be a pop-out wall gate, a hinge gate, or a dutch door, these barriers will help you divide and restrict rooms in your home. Yet another use for these cabinet hacks. 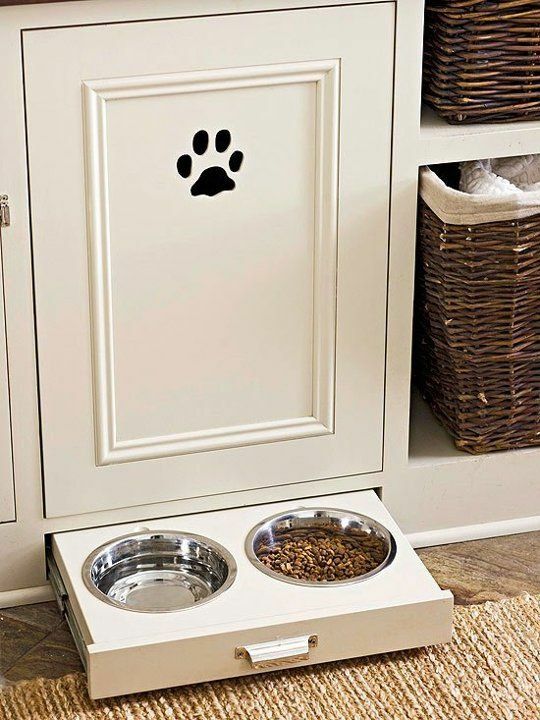 Install a baseboard drawer to hold your pup’s water and food dish in place. You could even use the cabinet above the drawer to store crunchies, chew toys, and other treats. For the apartment and condo dwellers out there, the best and most convenient home addition is the porch potty. 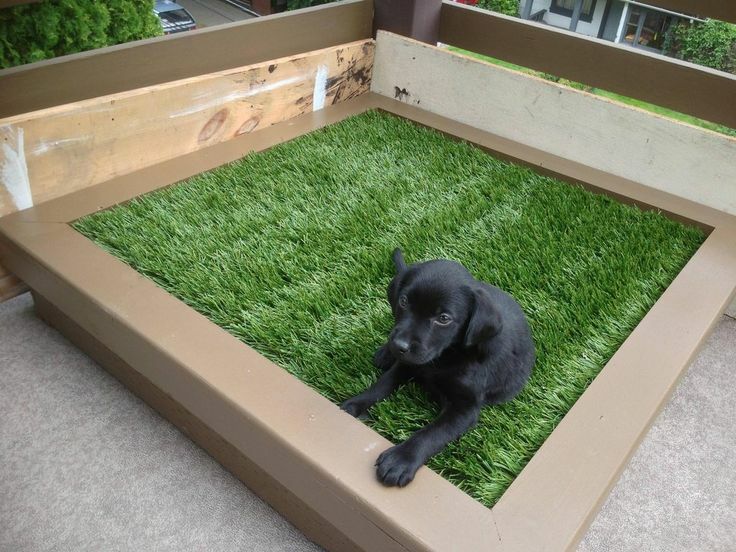 It’s a faux lawn with a draining system that allows your dog to go without having to go on a walk around the neighborhood. Really looking to go crazy? 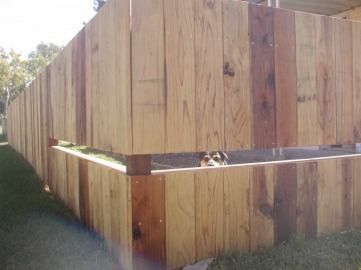 Put this awesome outdoor dog house in your backyard. There are other smaller options as well. For assistance installing your home’s new pet accessory? Give us a call – 866-FIX-MY-HOME. If air is escaping through your door, you’re not just losing heat in winter and cool air in summer, you’re wasting money on your energy bill and letting sound through. Stopping the problem may be as simple as weather-stripping the offending area. This is a fairly easy task to perform yourself. Begin by first measuring the top of your door frame. This is done by closing your door and measuring the top from one side to the other. Mark this length on the new piece of weather-strip that you have purchased. Next you will cut the weather-strip to the length that you have marked. It is often best to first cut the foam piece with a pair of sharp scissors and then use a small toothed saw to cut through the wood piece. Once you have the weather-strip cut, you will need to use 1.5 inch nails in order to hold it in place. When you put the cut weather-strip piece into place, you will want to ensure that the foam is positioned towards the door and is pushed up tight against it. This ensures a good seal. After you have the weather-strip in the right spot, use the nails to tack it into place. The nails should begin about two inches from the end to keep it from splitting the wood. All other nails should have about 12 inches of space between them. Do not hammer the nails in all the way yet, just enough to ensure the piece remains secure. Then you will need to measure the sides of the door frame. When cutting the side pieces, you will want to ensure that you also cut out a piece of one end of each side of the weather-strip in order to fit in the top weather-strip piece. The best way to ensure that you have the tightest possible fit is to file down the end that you sawed. The weather-strip should be put in with the foam piece pressed firmly against the door. You should again tack the piece into place, but not all the way. In order to ensure that you have the weather-strip in the right place and that you will have the best possible seal, open and close the door a few times. Watch to ensure that the seal is tight against the door and that the door closes all the way and latches. You can then complete your installation by driving all of the nails completely into the wood. Completing this task can be challenging. If you would prefer to have some help with this job, Handyman Matters is there for you. Contact Handyman Matters at 1-866-FIX-MY-HOME or enter your zip code above to find a location in your area. Your house is your home, your fortress of safety. It’s a place where you keep your most important belongings: your checkbooks, your jewelry, your heirlooms, your important documents and most importantly, your family. Everybody has the right to feel safe in their own home. The saying goes that a man’s home is his castle, and of course the first purpose of a castle is to be strong and secure enough to resist would-be intruders, and prevent them from getting inside. There are simple things you can do to safeguard your house, most of which you probably do already: lock your doors, lock your windows and keep lights on when you are away. But there are also more extensive things you can do, things that are sure to leave you, and your house, feeling a little bit safer. The following are some tips on securing your doors, windows, patio doors and more in order to make your home and valuables as safe as possible. Are the yard and pathways free of sight-line blocking branches and shrubbery? What kind of lighting illuminates your property? Is it motion-senor activated? Do the exterior lights you leave on in your absence all-encompassing? Do your neighbors have a good view of your lawn and walkway, to discourage lurking intruders? Doors are a burglar’s preferred method of entry. A deadbolt lock will provide a good degree of security for your front door. Poorly secured patio doors or French doors can be an open invitation for burglars to break into your home, so it is vital to ensure they have reliable locks. As an added precaution, you can get a chain fitted to your front door, which should offer some further peace of mind. If you have a letter slot in your front door, the slot should be no closer than 16 inches from the door lock, to prevent burglars reaching through and unlocking the door from the inside. If you are worried about mail theft, fit an internal cover plate or letter basket (with the bottom removed). A door viewer, or peephole or spy hole as they are sometimes called, is an important addition to your home, particularly if you have children. By installing a door viewer, you are able to see who is at the front door before opening it. Companies like Ring have come out with modern versions of the door viewer that allow you to see who is at your door from anywhere with your smartphone. This is great for kids as well, because they can’t always see through the peephole. If this sounds useful, check out our Secure & Monitor Package. Here are a few more technology-based home security ideas. When it comes to security, two doors are better than one. Installing a wrought iron door in your house, whether it’s in the front, back, or side of your house, is a great way to create an added level of security. A simple wrought iron door gives burglars another obstacle to overcome, and another reason to leave your house alone. Windows can be vulnerable to burglars, so it is advisable to have locking devices fitted, particularly for ground floor windows or ones which lead on to balconies. Remember to close all the windows whenever you leave the house, however briefly you go out for. Motion or heat sensitive lighting is a good way to deter potential intruders, and such devices are now affordable and widely available. This is a great form of preventative security, as it means that burglars will be less likely to want to try breaking into your home in the first place. You can also make things harder for burglars by keeping your garden open and trimming back bushes, meaning that they have nowhere to hide. Also, remember to put away any tools or ladders that might be outside, as it is important not to leave anything lying around that may actually help the burglar break in. Finally, don’t be tempted to leave a spare set of keys under a plant pot or doormat, or hanging inside the mail box –burglars know all these tricks, and these are the first places they will check. Once they have your keys, a burglar will have an easy way to visit and re-visit your house at will until you have the locks replaced. Another easy preventative measure is to make your home appear occupied. Leave the lights on when you go out for an evening, or consider using some home automation if you are going to be away for a longer period. Are there still people who go on vacation and allow mail and newspapers to stack up in front of their home? Amazingly, yes. Yet is there any clearer sign to passersby that people have been away from their house for an extended period than a collection of newspapers in the driveway, or envelopes jutting out of a mailbox? You can contact both your postal carrier and newspaper delivery person to temporarily stop their service, but a better choice is to ask a friend or neighbor to stop by each day just long enough to collect the paper and mail and keep them for you until your return. Yes, a burglar alarm may seem so “1980’s” but security never goes out of style. Not only do burglar alarms secure your house when you are away, such as on vacation, but they also keep you safe when you are home. Just telling others that they are there, such as with a sticker in your front door window or a sign on your front lawn, is a great deterrent. One of the most common reasons people are burglarized and assaulted is because of things that are broken and not fixed. Time after time, assailants are able to enter a house through a broken window or door that no longer locks. Do yourself and your family a favor and don’t wait to fix things: fix them immediately and sleep sound at night. Ever-Growing List Of Small Home Repairs? Author danielle.bergsteinPosted on March 30, 2016 Categories Bathrooms, DoorsTags Tile1 Comment on Ever-Growing List Of Small Home Repairs?